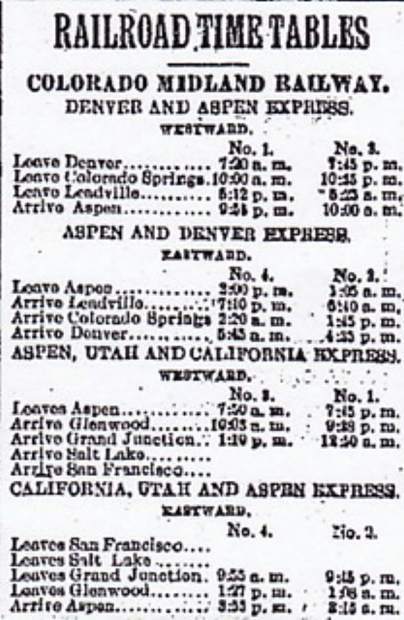 A Midland Railroad schedule of the 1890s lists departure times from Aspen to San Francisco. We think of contemporary Aspen as a seasonal city. Visitors arrive for recreation during winter and summer, and locals depart for their vacations during the shoulder seasons. During the mining era, different seasonal rhythms and constraints prevailed. Except for traveling salesmen, mining era visitors fell into two categories. Tourists came for natural amenities such as summer fishing and fall hunting — none came to ice skate or build snowmen. The other crowd traveled to Aspen to see family. Residents’ trips would not measure up to a family vacation in Disneyland or a week of sunshine on a beach in Cancun, Mexico. They traveled mostly to see family, often under dire circumstances such as to tend the sick or attend a funeral. Vacation travel, as we think of it, encountered the same limitations then as now. The wherewithal to take time off work and pay for train fare and lodging challenged all but the wealthy. Back then, an overnight excursion to Glenwood Springs to soak in the hot springs would be comparable to heading to Denver for a Broncos game today. A working family might afford such extravagance every once in a while. Aspen’s merchants and businessmen led more glamorous lives. Combining business with pleasure, they would often take their wives and sometimes their children on business trips. Chicago, San Francisco and New York topped the list of favored destinations. We know more about the travel of Aspen’s more prominent citizens because the newspaper reported them. Any travel by B. Clark Wheeler showed up in the gossip column, but then he owned and edited the paper. After Wheeler married the daughter of Davis H. Waite, soon-to-be governor of the state, Wheeler took her and her sister on business trips to New York. He also packed mineral specimens to display as he made the rounds of stockbrokers’ offices. At the time, mining shares represented a major portion of all traded stock. Wheeler frequently travelled to Denver for business with John Atkinson, his partner in the Little Annie Mine. Atkinson visited New Mexico annually for the duck hunt, accompanied by banker, electrical company executive and mine owner D. R. C. Brown. Atkinson, who owned a freighting company, traveled to Chicago and Kansas City to buy horses and mules. Not all travel, however, featured business or family. Well-heeled locals attended the World’s Columbian Exposition in Chicago. Others ventured to San Francisco to embark on ocean liners — some headed to Hawaii. Man-made objects ranked as memorable destinations, at least for travelers who reviewed them. The Washington Monument, the Brooklyn Bridge and the Eiffel Tower, each completed during the 1880s, topped the list. For a generation of Aspenites, the journey must have felt as compelling as the destination. Until 1887 they traveled by stagecoach, a rough and uncomfortable way to see the country. Eventually, the competitive rates of rail travel opened up a new world. The average wage earner could afford the excitement of a train trip to Denver. In today’s dollars, a ticket from Aspen to San Francisco by tourist class in a Pullman Sleeper cost $115 in 1900. By 1915, travelers visited any city joined by railroad tracks as commonly as we fly the airlines today. The trip may have taken more time, but they had more fun.